This was the beginning of a unique initiative – Christian-Jewish cooperation between Archbishop Dalla Costa and his clergy and Jewish leaders such as Raffaele Cantoni and Rabbi Nathan Cassuto. Thanks to the Archbishop’s letters and the goodwill of his people, many Jews found a safe haven in Catholic institutions in the city. A shelter was created in the seminary of Minore di Montughi from which the Jewish fugitives were taken to the different convents and monasteries, and some were even housed for a short time in the Archbishop’s residence. “I remember Sister Emma Lucia rushing in half dressed. She was dressed, but she was without her veil – they have this beautiful veil. She came running. I will never forget how she wanted to enter the hall in order to be with us, but there were two Fascists who did not let her in. She argued with them, told them: ‘I want to be with them’…She seemed so very beautiful in those moments, being so courageous”. Mother Busnelli was arrested, but freed thanks to the intervention of Archbishop Dalla Costa. On 6 December 1943, the Jewish women, including Wanda Pacifici, were deported to Auschwitz, where they perished. Wanda Pacifici’s two sons, Emanuele and Raffaele, stayed in the Instituto di Santa Marta in Settignano, near Florence where they were welcomed by Mother Marta Folcia. In his testimony, Emanuele Pacifici highlighted the special consideration the nuns gave to their religious needs, knowing that they were the sons of a Rabbi. 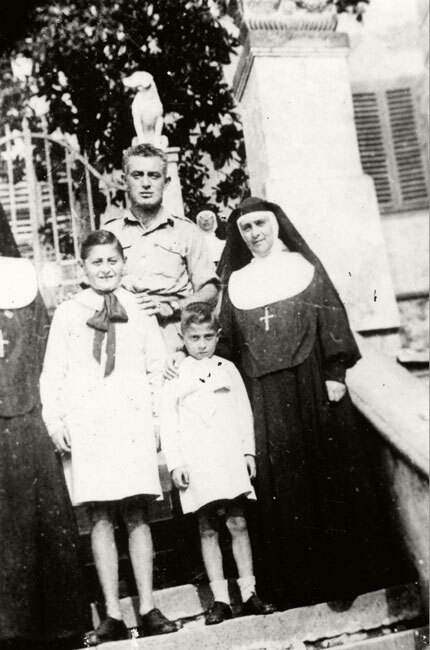 She would pronounce a special blessing which she taught herself in Hebrew, and when all the children had to kiss the cross, Mother Marta Folcia would cover it with her fingers, so that the two Jewish boys would kiss her hand instead. In April 1944, German soldiers entered the school in Settignano and occupied one of its wings for a month. The nuns kept the true identity of the Pacifici boys secret, and the soldiers were unaware that two of the boys in the school were Jews. In June 1944, with the arrival of the Allied forces, Settignano became the center of several battles, and soon after the town was liberated. Emanuele spotted a soldier, of the Jewish Brigade, recognizing the emblem of the Star of David on his sleeve. Consequently the two boys left the school where their lives had been saved. On December 10, 1972, Yad Vashem recognized Father Cipriano Ricotti as Righteous Among the Nations. On December 13, 1994, Yad Vashem recognized Mother Marta Folcia, Mother Benedetta Vespignani, as Righteous Among the Nations. On July 31, 1995, Yad Vashem recognized Mother Sandra Busnelli as Righteous Among the Nations. On February 29, 2012, Yad Vashem recognized the Archbishop of Florence Elia Dalla Costa as Righteous Among the Nations.